With a new year in full swing, I’ve been busy talking with clients about their goals to make their families happier and healthier this year. There is a common thread to my advice that I think all parents should embrace: strengthen your child’s well-being by establishing positive connections between the family, their school, and the community. In this blog post, I’ll be sharing several ideas for how you can get started. Sponsored: I’m thrilled to be working with Revolution Foods on this blog post. Revolution Foods (www.revolutionfoods.com) is on a mission to build lifelong healthy eaters by making kid-inspired, chef-crafted food accessible to all. Each week Revolution Foods proudly designs, produces and delivers 2 million healthy, affordable meals to schools and community sites nationwide. Follow Revolution Foods on your favorite social media channels. Commit to sit! Have family meals seven or more times per week for better health. In my family, (and I’m sure yours, too) we have busy schedules that make it challenging and a bit stressful to consistently get everyone to the table at the same time. You might be surprised to know that it only takes one parent or caregiver eating with a child to constitute a “family meal,” and that sharing breakfast or snack time with at least two family members yields positive health benefits. The American Academy of Pediatrics recommends that children partake in seven or more family meals per week because research shows the entire family eats better as a result. On average, when families eat together, everyone at the table will eat one more serving of fruit and/or vegetables each day, more calcium rich foods, and fewer carbonated beverages. Just being at the table together is a powerful way for families to connect. Dinner time is a great opportunity to ask your kids about meals at school. Ask them: What is being served? Are they enjoying the taste and getting nourishment too? 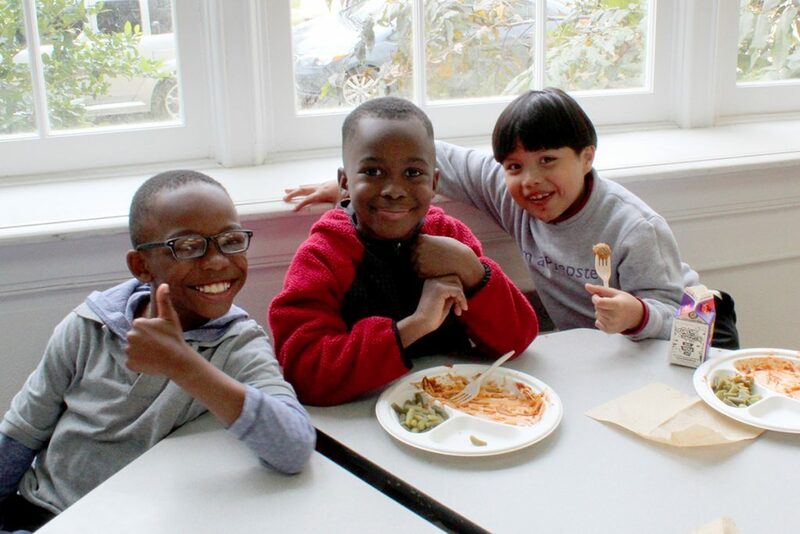 We’re lucky in the metro Washington D.C. area to join 2,500 school and community sites across the nation, where Revolution Foods crafts 2 million well-balanced meals that exceed nutrition guidelines per week! 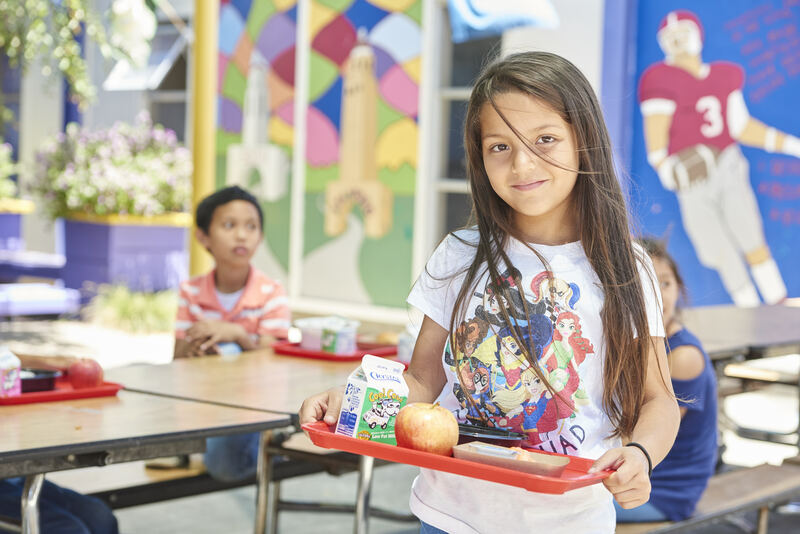 If you are able to, get your child to share feedback on school lunch, be proactive, and make sure that school officials understand any concerns or opportunities for improvement. Plan balanced plates as a family. Make a list of fruits, vegetables, snacks and meals you already like, and ones you would like to try. Get inspired by the options that come to mind first. Poll family members to get their ideas and add them to your list, too. Eating better is a group effort, and there’s a place for everyone’s preferences somewhere on your menu. You don’t have to be a trained chef to create a more balanced meal. One small tweak can make any meal more nutritionally balanced. Some shredded carrot here, diced mushroom there – you can’t mess it up! If there’s a fruit or vegetable your child says they don’t like, ask this question: “What ideas do you have that might help you enjoy it or be willing to try it?” For example, I have one daughter who loves carrots with hummus, but she doesn’t enjoy them plain. The other one loves broccoli with butter, but only after it’s been steamed or sautéed. In addition to fruit and vegetables, whole grains and protein-rich foods help make the meal complete. For example, black bean quesadillas with grilled peppers and baby spinach served with a side of berries. Or, mac-n-cheese with “little trees” (broccoli or cauliflower!) and a side of fish or tofu and fruit. Involving your kids in meal planning builds deeper connections by letting them know their interests matter to you, even as you are taking steps to bump up the balance of the meal. Revolution Foods incorporates the same approach when crafting well-balanced meals. As part of their commitment to stay kid-inspired, the company engages with kids at every step of the development process to ensure a menu they’ll love. As a mom, this is meaningful to me because I want my kids to understand that good-for-you food is enjoyable and delicious. The best meals are the ones your family loves to eat. The taste of the food and enjoyment of the experience are both fundamentally important. Introducing new foods at mealtime and opting for a variety of snack options can be more fun than you would think. You can turn it into a game like “top chef” by adding a secret ingredient, let your kids help cook, and act as a judge for new recipe creations – thumbs up, sideways, or down. One of my favorite things about Revolution Foods is their effort to talk directly to kids about how happy they are with school lunch. Each month, they speak with more than 2,000 kids to gauge satisfaction level of their chef-crafted meals so they can make continuous improvements to their menus! Add to the fun and family bonding over food by creating an enjoyable experience to go along with the meal. This boosts everyone’s sense of connection and gratitude for the meal. It could be a little thing like lighting a candle (or several!) 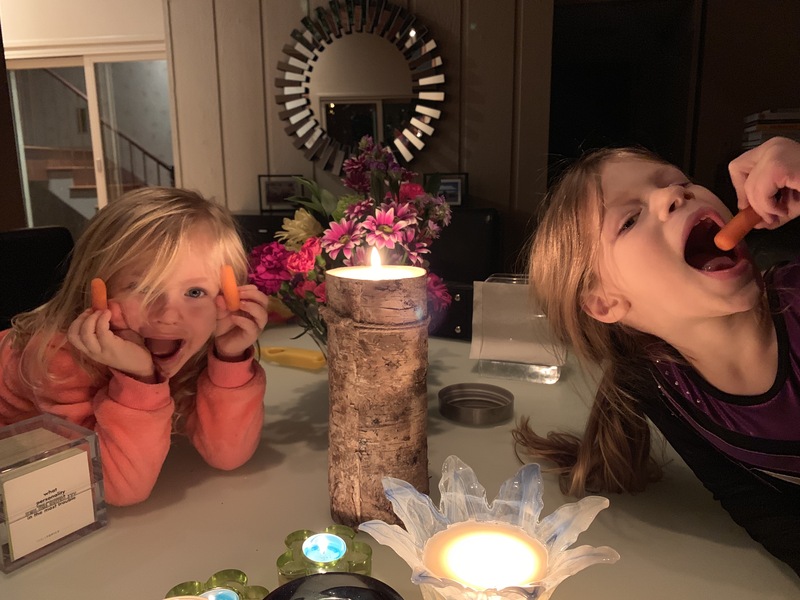 My girls love the ambience and they love blowing them out at the end of dinner. Have your kids help make a flower arrangement for a bright, colorful centerpiece to enjoy at mealtime. Bring the outside in by picking wild flowers, evergreens, pine cones, or twigs. Your kids get to enjoy their neighborhood, nature, and create something for the family to enjoy. Try fresh herbs too. A jar with a little water, basil and cilantro looks and smells wonderful. Plus, you’ll use the herbs in cooking for more flavor in your dishes throughout the week. Get involved in all the ways your child is nourished. You can enhance your child’s well-being by becoming more involved with the school directly. If you feel inspired by what I’ve already shared, learn more about Revolution Foods on their website and consider presenting it as a key partner for creating better school meals. You may be surprised to know when a school partners with Revolution Foods, it comes with nutrition education perks too. Beyond the lunch line, Revolution Foods brings nutrition curriculum, cooking classes, gardening lessons and other educational events to students in partnership with community partners, including FoodCorps and Share Our Strength. 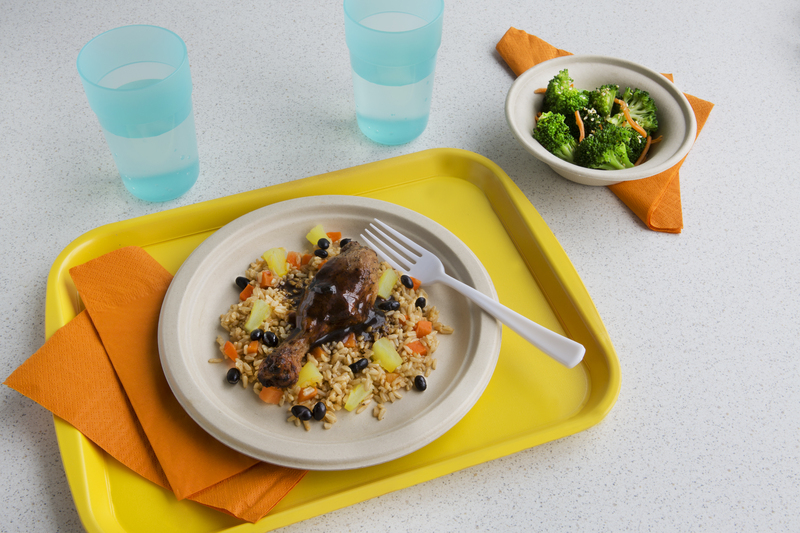 The company was ranked the #1 healthiest provider of nutritious meals in a recent study at UC Berkeley. I believe that between the powerful connections we build with our kids at home and school, we’re strengthening their eating patterns for a happier and healthier future. Now, I’d love to hear from you. Leave a comment below and let me know how you help your family connect more this year. Any other planning tips or ideas for harnessing your family’s preferences? I’d love for you to share them in a comment, or, feel free to ask a question. 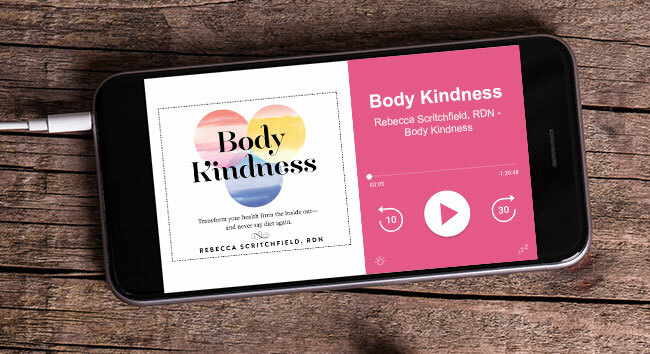 Contest alert: Leave a comment below sharing a meaningful connection you and your family have recently made with food, and you will be entered to win a signed copy of Body Kindness. (Terms: US Residents Only, Please allow 2 weeks for delivery. One winner will be chosen on 2/28/19. All eligible entries must be received by 11:59 p.m. ET on 2/27/19). My family and I recently did Kris Carr’s 5-day Green Drinks Challenge, and we liked making the smoothies so much that it’s become a morning ritual! At night, we talk about what recipe to try the next morning, and then the next day we “toast” with our (generally green) drink. It is great to know that we are getting fruits and veggies in our mornings and even better to enjoy the moment of togetherness before we head off to school and work. Hello. Thank you for a great post. Really inspiring. I managed to get my kids to eat healthy when we started to cook together. It is a bit more time consuming and kids can help only with some things, but they tend to eat better when they have been involved in the meal preparing process. It not possible to involve kids every day, but a start, weekends will do as well. We don’t have kids yet, but my husband and I have been working on eating a mindful meal at our dinner table instead of mindless eating on the couch in front of the TV. While we of course think we’ll eat at the dinner table when we have kids, if we don’t cultivate that now, how will we change our habits when the time comes? Eating at the table helps me eat mindfully and enjoy what we’ve cooked together!